Shern has not got many playmates. At 13 months, I am of course still his favourite playmate. He just likes being close to me...tailing me everywhere I go, even to the toilet. But there are a few others whom Shern likes to play with. 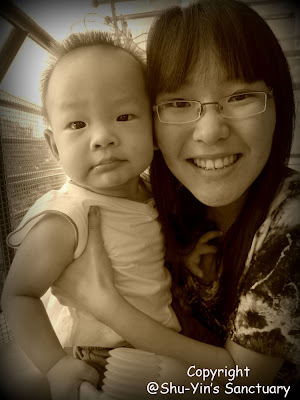 One of them is my sis, Shu-Min. Shern calls him Min-Yeeyee. He knows where her room is in the house and will often walk there with the help of his bike/walker. He has many toys being kept in Min-Yeeyee's room. His gigantic Kick & Whirl Carnival is there and he knows it. Min is one of the few people whom can entertain him whenever he cries. She knows how to distract him by playing with him, or just taking him out the balcony just to see 'any birds up there'? Shern is fond of birds btw. Min is certainly most helpful and I don't know what I will do without her.